Bon Appetit, my friends, and welcome to Chefs de France! This authentic French bistro serves all of your favorites, from escargot to profiteroles! Settle in at one of the window-side tables to enjoy some World Showcase people-watching, or ensconce yourself in the middle of the action in the back room with the soaring ceiling. This is truly one of my favorite dining experiences in Disney World, and I can highly recommend it. From food to service, it’s a winner. 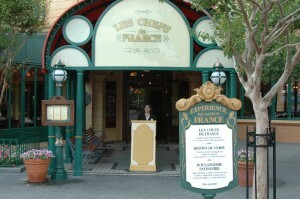 The Chefs de France menu is inspired from the French Brasseries Bocuse. Appetizers may consist of a classic onion soup or an Alsace specialty: flat bread baked with cream fraîche, onion and bacon. Entrees may include roasted duck with cherries or broiled salmon with green lentils and smoked bacon. Finish your meal with the Chefs de France signature crème brulée or the famous profiteroles topped with warm chocolate. My favorite from the menu is the gruyere cheese-baked Mac and Cheese! Chefs de France occasionally offers a prix fix lunch menu. It includes an appetizer, entree, and dessert from a selected menu.